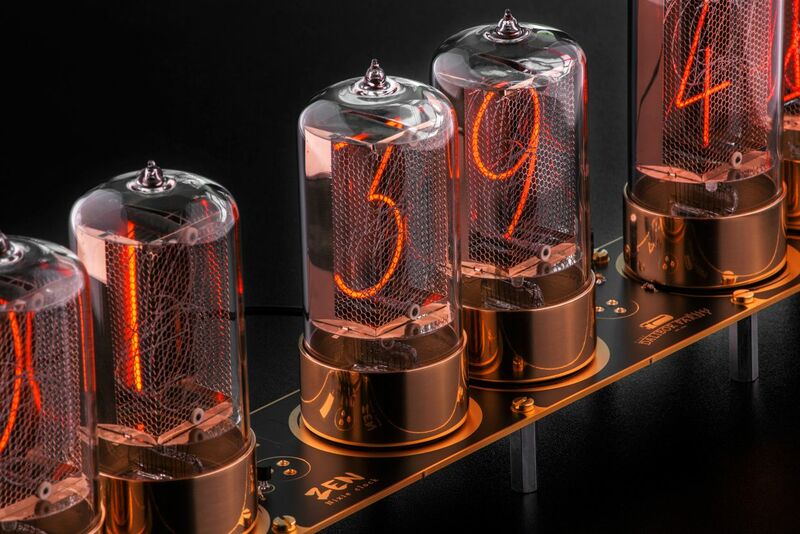 Nixies Reborn: This clock features modern-day Nixie tubes made by Dalibor Farny. The Czech engineer has revived the manufacture of the distinctive display devices, which had their heyday in the late 1950s and 1960s. On a cold December morning in the Czech village of Březolupy, a man stops his truck in front of a 17th-century castle. He puts on some heavy gloves, steps out of the truck, and opens the back hatch. Carefully, almost lovingly, he unloads crate after crate of heavy equipment and supplies—an industrial glass lathe, a turbomolecular vacuum pump, and glass. Lots and lots of glass. The man is Dalibor Farny. In 2012, Farny began working to revive the manufacture of a display technology called the Nixie tube, the last commercial examples of which were produced when he was still a child. These neon-filled glow lamps were ubiquitous in the late 1950s and 1960s, illuminating numbers, letters, and symbols in scientific and industrial instrumentation. Born in the basement of a German-American tinkerer in the 1930s and later commercialized by the business equipment maker Burroughs Corp., Nixies displayed data vital to NASA’s landing on the moon, lit up critical metrics for controlling nuclear power plants, and indicated the rise and fall of share prices on Wall Street stock exchanges, among thousands of uses. For many people, the warm glow of the Nixie came to evoke an era of unprecedented scientific and engineering achievement, of exciting and tangible discoveries, and of seemingly limitless progress. Remarkably, it continues to do so, even for people who, like Farny, grew up long after the tubes had faded from common use. In the 1970s, Nixies were eclipsed by LEDs, which were not only much cheaper to make and use but also more versatile. The tubes might have died the lonely death of countless other obsolete devices—and yet they did not. Some Nixies lingered on in legacy equipment, of course. But their extraordinary resurgence didn’t really begin until around 2000, when a small but devoted cadre of hobbyists, collectors, and aficionados began searching out and buying old, never-used tubes and designing clocks around them. Nearly two decades later, the movement is still going strong, and Nixies now inhabit a unique niche as ultracool retro tech aimed at discriminating consumers. We may never fully understand why this quirky technology, out of innumerable others, has been plucked from obsolescent obscurity. But some glimmers, at least, of its enduring appeal emerge from the tubes’ colorful history. It’s a classic story of 20th-century innovation, complete with a quirky genius, shrewd corporate maneuvering, and brilliant flashes of insight. The Nixie tube may seem like an unnecessarily complicated invention for something as straightforward as displaying a number. But if you think about what was technologically possible in the middle of the 20th century, you soon realize it was the most logical and reliable option available. It was also the culmination of a long line of breakthroughs. Nixie tubes operate through a process called gas discharge. This phenomenon occurs when electrically charged particles, typically electrons, move through a gas at a high velocity—roughly 2 percent of the speed of light. The speeding particles collide with the gas atoms or molecules, ionizing them and creating an energetic plasma of charged ions and electrons. The ions, excited to higher energy states, shed the excess energy as photons of light. The same basic process produces the glow of neon signs and the northern and southern lights. The color of the light depends on the gas: Neon ions emit a red-orange light; hydrogen emits bluish purple; nitrogen gives a spectacular purple; and krypton glows whitish blue. The earliest application of gas discharge was the Geissler tube, invented by the German physicist Heinrich Geissler in 1857. The tube consisted of a simple glass bulb with an electric terminal on each end. Air was evacuated from the bulb, which was then filled with neon, argon, or some other gas; some tubes were filled with conducting fluids, minerals, or metals. Applying a direct current of a few thousand volts ionized the gas and caused it to emit light. Scientists used Geissler tubes to understand the nature of electricity, and they were sold as decorative curiosities. The tubes also served as a milestone on the way to the invention of the neon sign, in 1910, and decades after that, the Nixie. In the late 1920s and early 1930s, inventors realized that the Geissler tube’s discharge glow could be extended to the cathode and that you could shape the cathode to confine the glow. By using an appropriately bent wire as the cathode, for example, you could display numbers or text. One of the earliest patents for such a design went to the German inventors Hermann Pressler and Hans Richter (U.S. Patent No. 2,138,197) [PDF], for what they called an “electric discharge lamp” that functioned as a “self-luminous sign.” As the duo noted in their patent, awarded in 1938, their lamp was more readable than a traditional neon sign and would be cheaper to manufacture, because you wouldn’t have to bend glass tubes into the form of letters or numbers. On the other hand, you needed a glass enclosure to contain the gas and provide an envelope for the wires spelling out your message, which would limit the size of your display. For a large illuminated advertisement in, say, New York City’s Times Square, Pressler and Richter’s technique was simply impractical. No surprise then that the invention didn’t find many takers. Today, just a few small versions are in the hands of collectors. The Proto-Nixie Tube: In May 1934, Hans P. Boswau filed two U.S. patent applications for a “glow indicator.” His patents contain the basic elements for what later came to be called the Nixie tube. Another inventor, though, had a better idea. Hans P. Boswau, a German immigrant who’d settled in the Lake Erie shore town of Lorain, Ohio, worked as chief engineer at the Lorain County Radio Corp. Through his job, he would have been familiar with many of the latest technological developments of his day. At some point, Boswau decided that he needed a device to display numeric symbols and letters. On 9 May 1934, he filed two U.S. patent applications—No. 2,142,106 [PDF] and No. 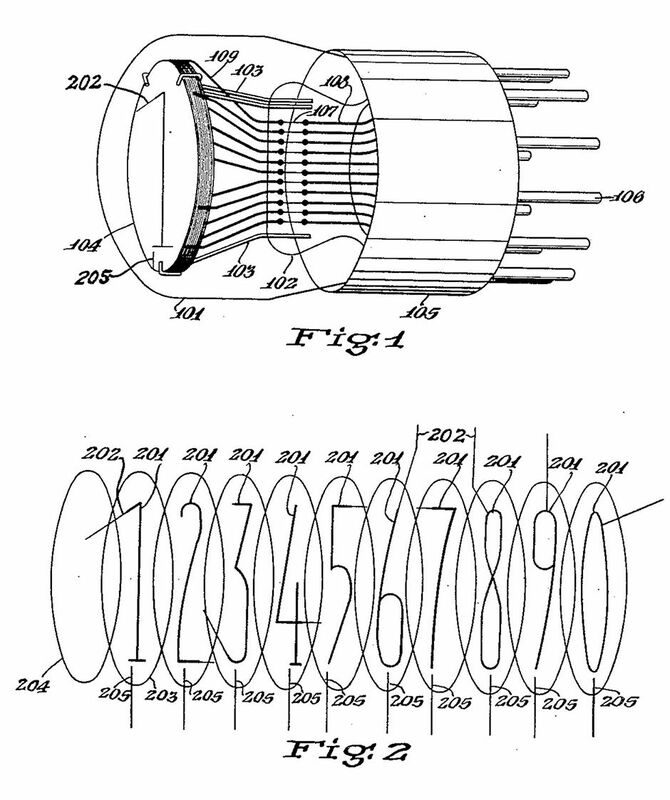 2,268,441 [PDF]—which contain the first complete descriptions of what later came to be called the Nixie tube. Boswau’s key innovation was to stack the cathodes behind one another within the same tube so that the cathodes could be illuminated individually. You could thus configure a single tube with 10 cathodes representing the numerals from 0 to 9. Interestingly, Boswau’s patents were issued to him and not to his employer, so he probably hadn’t intended them for use on the job. In 2009, a Canadian Nixie tube enthusiast named Randall Logan tracked down Boswau’s daughter, then 83, who told him that her father may have constructed primitive versions of his “glow indicator” in his basement workshop. But it appears that Boswau, who died in 1971, never tried to commercialize his indicators, and they likely never left the basement. Also-Ran: Among the companies vying to introduce numeric display devices was National Union Radio Corp., but its GI-21 Inditron tube [above] couldn’t compete with the Nixie. Surrounded as we are with electronic gadgets bearing digital readouts, it’s hard to imagine a time when numeric displays were virtually nonexistent. In an analog world, though, you didn’t really need them. When Boswau was inventing his tube, most circuit indicators took the form of lightbulbs or analog panel meters. Then came the transistor in 1947 and the rise of digital electronics. Now you could reliably define discrete device states without the use of mechanical switches and perform rapid calculations without the use of room-size computers. With all those calculations came lots of numbers, which of course you’d want to display. But none of the existing technologies was quite up to the task. In particular, no display could withstand the strong vibrations, broad temperature ranges, and other demands of space exploration and the latest generation of jet aviation. Clearly, a better numeric indicator was needed. Several companies rose to the challenge. The first post-Boswau patents for a numerical display tube were filed by Northrop Aircraft [PDF] in June 1950. I’ve found no evidence that the company seriously developed them, however, nor have any Northrop tubes surfaced in recent times. A more successful contender emerged in May 1954, when National Union Radio Corp., a well-known manufacturer of vacuum tubes, unveiled its line of neon-filled indicator tubes [PDF]. Called the Inditron, the device resulted from “four years of research and development [and] two years of pilot production,” according to an advertisement. Much like Boswau’s earlier invention, the Inditron consisted of a small glass bulb containing a stack of hand-bent numerals that were electrically isolated from one another. Contacts from each numeral fed through a glass seal to the outside of the tube, where they connected to a power supply. The numerals served as the cathode, but there was no fixed anode. Instead, the numbers that weren’t in use functioned as the anode. Let’s say you were displaying a 7. External circuitry would connect that number to the negative terminal, while numbers 0, 1, 2, 3, 4, 5, 6, 8, and 9 would connect to the positive terminal. Needless to say, the circuitry required to continuously reconfigure the anode was complicated. Meanwhile, engineers at Ericsson Telephones, in England, were developing a simple display tube, for which they received a British patent in 1951. Rather than having separate wires for each numeral like the Inditron, the tube illuminated connecting segments to form each number, much like the seven-segment numbers that are common today in microwave ovens and digital watches. Later, in 1958, Ericsson filed for a patent for a more refined numeric indicator, but it came too late. By then the reign of the Nixie had begun. Golder Age: After the Nixie tube was introduced by the business equipment maker Burroughs Corp. in 1955, it quickly became the device for displaying numeric values. The ZM1020 was one of the most common types. Like these other companies, Burroughs, a major manufacturer of calculators, computers, and other business equipment headquartered in Plymouth, Mich., was also keen on numeric displays. But it lacked the in-house expertise to develop them, and so the company went out and bought the requisite know-how. In 1954, Burroughs acquired Haydu Brothers, a vacuum-tube manufacturer in Plainfield, N.J., known for its high-precision manufacturing capabilities. It also recruited the engineer Saul Kuchinsky, a former employee of National Union Radio who’d worked on the Inditron, to lead a lab at the Burroughs Research Center in Paoli, Pa. Those two moves gave Burroughs everything it needed to develop a numeric indicator tube. Haydu Brothers had been founded in 1936 by two Hungarian-American brothers, George and Zoltan Haydu, and their father, John Haydu. It quickly gained a reputation for making precision metal parts used in constructing vacuum tubes. Burroughs wanted Haydu to manufacture its high-precision tubes, particularly its line of beam-switching tubes, trademarked as the Trochotron. Beam-switching tubes were primarily used as high-speed counters, but they weren’t able to display the count. For that, Kuchinsky had to construct a new device, and he drew on his experience at National Union. The Paoli team got to work on a display tube that was similar to the Inditron but much improved. Meanwhile, Kuchinsky also served as general manager of the former Haydu plant in New Jersey, where he could oversee the prototyping of the Paoli lab’s devices. After some tinkering, Wolfe wrote, they discovered that the addition of mercury vapor would greatly extend the tube’s life span. The sputtering had been caused by the accelerated neon ions striking the cathode. But when the neon ions collided with the heavier mercury molecules, their energy dropped below the point where they could damage the cathode. “We secured a tiny ampule with mercury sealed inside, wrapped a few turns of resistance wire around the ampule, [and] connected the ends of the wire to two of the [tube’s] pins,” Wolfe wrote. The tube was then sealed, and the team ran current through the wire, which heated and broke the ampule, releasing the mercury. In August 1955, Burroughs unveiled its new indicator tube at Wescon—the Western Electronic Show and Convention, in California—which was for many years the leading U.S. electronics event. Soon after, it began shipping the first tubes to customers. That December, the company filed for a patent on its “glow indicating tube” [PDF] The devices were mechanically superior to the numeric display tubes still on offer from National Union: They had dedicated anodes made from wire mesh, and instead of hand-bent wires, the cathode numerals were etched out of thin sheet metal. The addition of mercury prolonged the tubes’ life span, eventually to more than 200,000 hours. Companies in the United States and abroad rushed to license the Nixie technology from Burroughs, which also supplied the tubes as OEM products that could be integrated into other companies’ systems. The tubes quickly became the device for displaying numeric values in multimeters, counters, and other scientific and industrial equipment. A remarkable variety of tubes emerged, ranging from miniature versions for tabletop instruments to large tubes with 13-centimeter-tall digits that could be read from afar. Throughout the 1960s, over two dozen companies in the United States, Europe, the Soviet Union, India, China, and Japan were making and supplying Nixies. 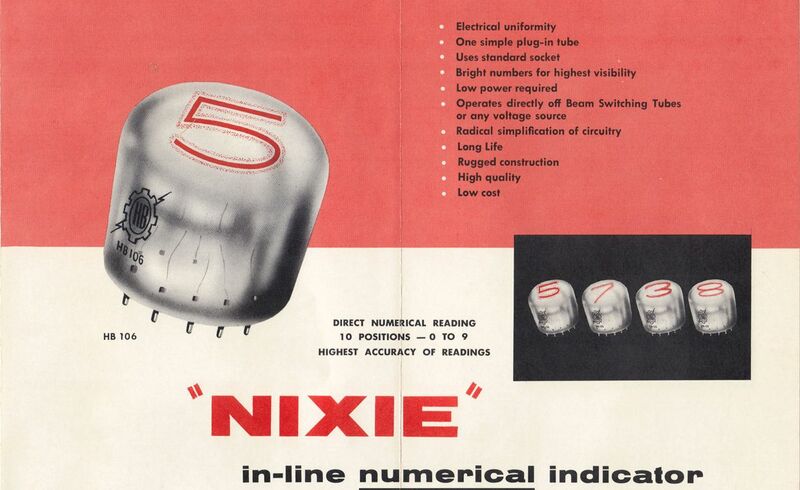 This period, from 1955 through the 1960s, was the golden age of the Nixie, but its replacement was already in the works. In 1962, Nick Holonyak Jr., working at the General Electric Laboratories in Syracuse, N.Y., managed to control the electroluminescence of a mixed crystal of gallium arsenide phosphide, and the light-emitting diode was born. But it would take some years to turn the device into a sellable product. This juxtaposition of the LED as the upstart technology challenging the incumbent Nixie may strike you as funny, but that’s because you know how the story ends. What you might not know is that the first commercial LEDs were not nearly as bright and reliable as today’s. Engineers continued to extend the devices’ life span while boosting their efficiency and brightness and expanding their range of colors and applications. 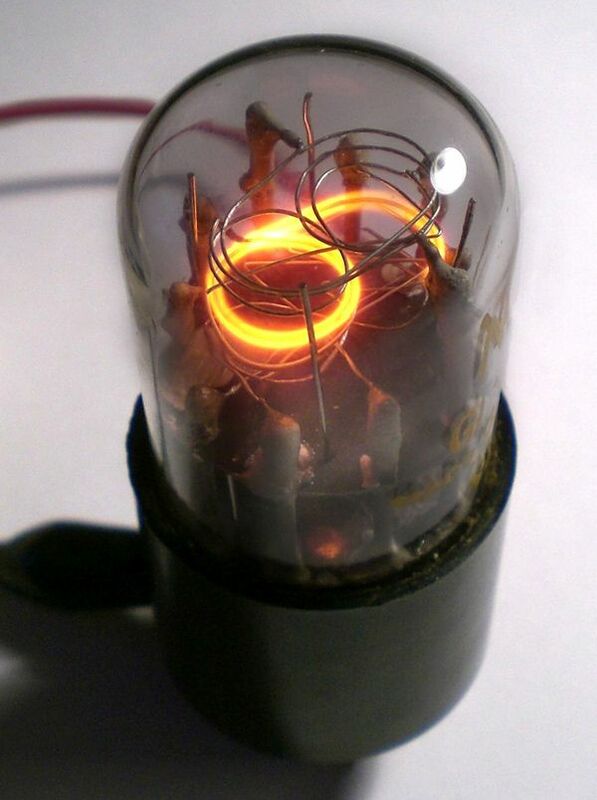 With the rise of digital integrated circuits, it made more sense to use low-voltage readout devices like the LED rather than the high-voltage Nixie tube, which typically required 200 volts or more to ionize the neon and get a nice, bright glow. Slowly but steadily, Nixies faded from view. The Soviet Union was the last country in which the tubes were continuously manufactured, into the early 1990s. Big & Beautiful: The F9020AA Nixie tube was manufactured in France starting in 1962 and used in high-end clocks. At their peak, hundreds of types of Nixies were made by more than two dozen companies worldwide. Our story might have ended there but for the rise of another, far bigger invention: the World Wide Web. Very quickly, the Internet enabled Nixie tube fans from all over to connect and share ideas, pictures, and videos of their projects. The main virtual meeting ground became the Yahoo group Neonixie-l, which a decade later migrated to the Google group of the same name. A steady supply of Nixie tubes and supporting electronics began popping up on online auction and electronics websites. Occasionally, younger people who’d never encountered a Nixie in the wild would stumble upon the group and become mesmerized by the vivid images of the strangely glowing displays. Vintage Nixie tubes began to surface in consumer products, such as clocks, chessboards, and even wristwatches. By now you may be wondering: If Nixie tubes are no longer being widely manufactured, won’t they disappear completely at some point? It’s true that the most common types of vintage Nixies are still available, but their prices in many cases have risen by a factor of 10 or 20 in the last decade or two. The largest Nixie tube, the CD47, now sells for around US $1,000; back in 2000, it could be had for $100 or less. Some individuals, spotting an opportunity and a challenge, set out to make their own artisanal Nixie tubes. These new Nixie pioneers include Aleksander Zawada in Poland, Ron Soyland in the United States, and the aforementioned Dalibor Farny. A YouTube video of Farny demonstrating his Nixie process has garnered 1.3 million views. Farny makes his tubes in small batches and sells them for a profit, thus ensuring that a bygone technology remains in view. In the now-prophetic words of that 1971 editorial: Nixie tubes are here to stay. Jens Boos was an impressionable 15-year-old when he encountered his first Nixie tube. The year was 2005, and Boos was visiting the Heinz Nixdorf MuseumsForum, in Paderborn, Germany. The teenager liked the various displays on computer history well enough, but what really caught his eye was a set of four Nixie tubes, glowing orange as they cycled through the first few hundred digits of pi. He was enchanted. Nixie tubes are like that for some people. The exhibit’s accompanying placard gave no information about the tubes, so Boos hit the Internet. “I didn’t even know what they were called, so I searched on ‘glowing number display,’ ‘orange number counter,’ things like that.” He soon discovered the tubes’ distinctive name, the fact that they hadn’t been manufactured since the early 1990s, and also a lively online community of Nixie collectors. 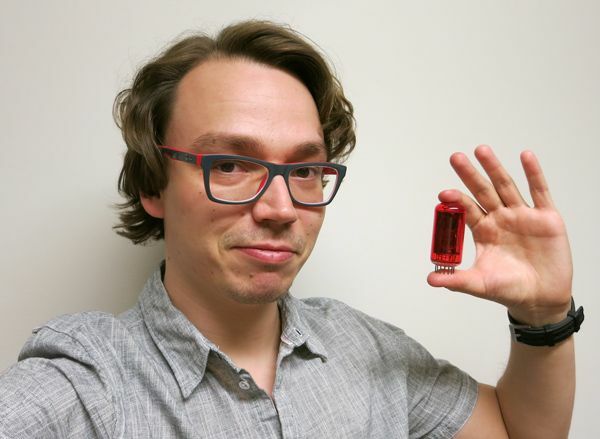 Boos had to curtail his tube-related activities when he began pursuing a Ph.D. in theoretical physics, as a Vanier scholar at the University of Alberta. But when IEEE Spectrum invited him to write about Nixie tubes, he gladly agreed. He drew on his personal files, as well as records from the Charles Babbage Institute and notes from Spectrum executive editor Glenn Zorpette, another Nixie fan.